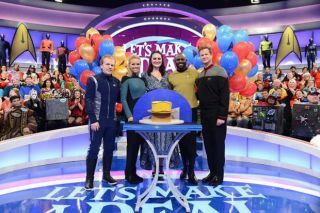 CBS' "Lets Make a Deal" is planning a special "Star Trek"-themed episode for its Feb. 4 episode - including an appearance by "Star Trek: Discovery's" Mary Chieffo. First reported by Deadline, this unique crossover is helped in part due to CBS/Paramount owning both franchises. "The Star Trek team was an absolute joy to work with. They gave us access to props, costumes, and a wealth of knowledge about the series," said Richards. "On our end, the Let’s Make a Deal' team had a great time coming up with deals that would fit into the Trek universe and adapting some of our current games to be played through a Star Trek lens. I think fans of both shows will really enjoy what we came up with, and it’s definitely a type of special that we would love to do again in the future." When asked which "Star Trek" character would be the best "Let's Make a Deal" contestant, Richards made the arguement for James T. Kirk. "Of all the Star Trek characters, I think Kirk would be the best at Let's Make a Deal. This game requires a solid gut instinct and quick decision making. . . two attributes that Kirk definitively has!" Richards said. "We would also love to watch Spock grapple with our show. There is nothing 'logical' about what we do, so listening to him try to reason through the decision points would be amazing."